The 52-acre Morris Landing Clean Water Preserve contains coastal shrub scrub and forest habitat, salt marsh and tidal creek areas and has over 3,000 feet of shoreline along Stump Sound. The preserve is located in the heart of the very productive shellfish growing areas of Stump Sound, and is an excellent site to stage oyster restoration and shellfish enhancement activities. 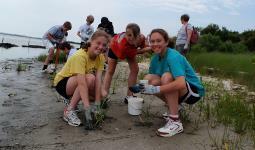 Since 2005, the North Carolina Coastal Federation has partnered with other groups to complete several shoreline restoration projects. 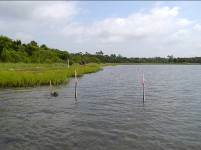 Most recently, the fifth phase of the project — constructing a 310-foot living shoreline using oyster sills and marsh grass — was completed in July 2016. 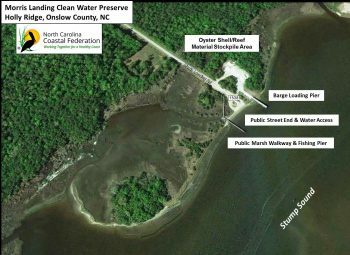 The North Carolina Coastal Federation and the North Carolina Division of Marine Fisheries (DMF) partnered to submit an application to the North Carolina Clean Water Management Trust Fund to purchase the property. In 2004 the Trust Fund awarded almost $1 million in funding to purchase Morris Landing. 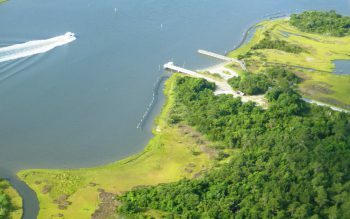 The grant enabled the protection of Morris Landing and opened the doors for projects to restore salt marsh and oyster habitat, enhance public access and recreation, expand shellfish enhancement activities in the area and protect the waters of Stump Sound in Onslow County. 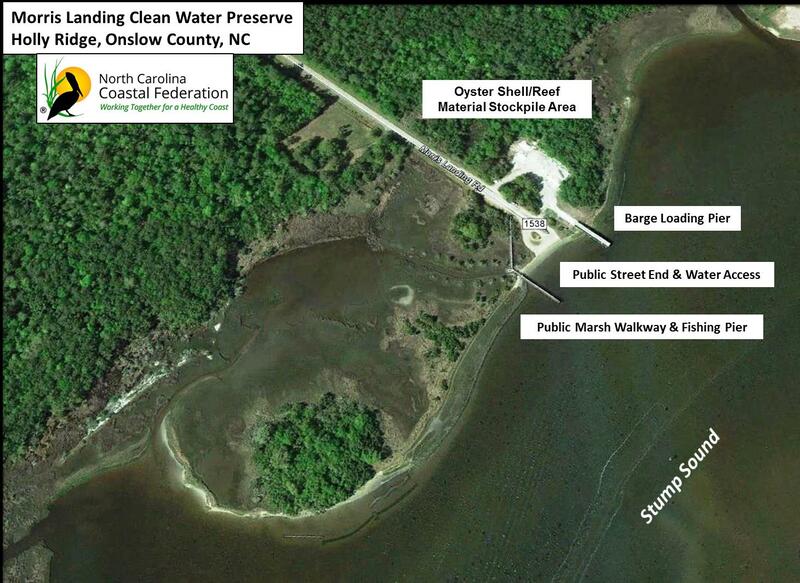 In 2005 the federation began to improve public access on the Preserve, initiate a multi-phase shoreline restoration project and partner with DMF to create the oyster shell stockpile area and barge loading facility. 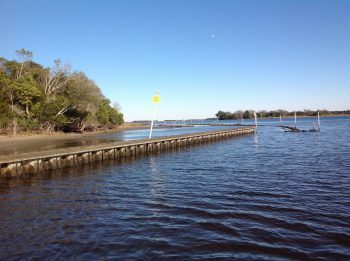 The community-fishing pier was built to enhance public access to the site and prevent vehicles from damaging the estuarine shoreline. Water quality has declined since the sound was designated as Outstanding Resource Waters in 1989. Today, because of nearby clearing, ditching and development resulting in excessive polluted runoff, most of the sound is closed to shell fishing after one to one-and-a-half inches of rain in a 24-hour period. A decline in water quality, coupled with continued high harvest pressure and disease, have stressed the oyster population in Stump Sound. Valuable estuarine shoreline salt marsh habitat is being lost to erosion from boat wakes and shoreline hardening. The loss of oyster and salt marsh habitat is a critical issue for the public resources of Stump Sound. Phase I – 2005: A 600’ x 6’ living shoreline with a low profile stone sill was established to protect and restore the eroding estuarine shoreline and salt marsh habitat. 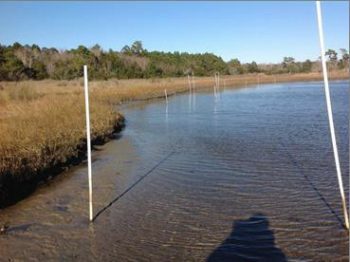 The protection afforded by the sill coupled with plantings of smooth cordgrass (Spartina alterniflora) seedlings behind the sill resulted in the restoration of a vibrant salt marsh habitat. Funding for the project was provided by: NOAA Restoration Center’s Community-based Restoration Program and Restore America’s Estuaries. Phase II – 2008: The federation completed a 200-foot restoration project along the eastern shoreline of the property. 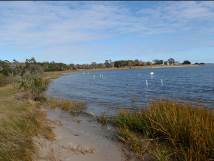 The purpose of the project was to restore oyster and salt marsh habitat and provide protection for the existing eroding shoreline. The project consisted of a 150’ x 8’ oyster shell bag reef/sill and 150’ x 25’ salt marsh restoration project, and an additional 50-feet of shoreline regrading and marsh restoration. 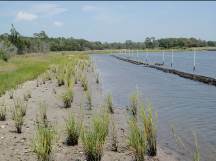 Funding for the project was provided by the North Carolina Department of Justice’s Environmental Enhancement Grant Program and EEG funding through the Onslow County Soil and Water Conservation’s Community Conservation Assistance Program, NOAA Restoration Center’s Community-based Restoration Program and Restore America’s Estuaries. 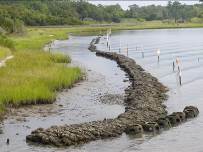 Phase III – 2011: A 225-foot living shoreline incorporating shoreline stabilization, oyster reef and salt marsh restoration was constructed along the northeastern shoreline of Morris Landing. The project consisted of two 75’ x 6’ oyster reef/sills made up of concrete oyster domes, one 75’ x 8’ oyster reef/sill made up of oyster shell and marl bags and 225’ x 25’ of salt marsh restoration. Funding for the project was provided by the North Carolina Department of Justice’s Environmental Enhancement Grant Program through the Onslow County Soil and Water Conservation’s Community Conservation Assistance Program, Fish America Foundation, NOAA Restoration Center’s Community-based Restoration Program and Restore America’s Estuaries. 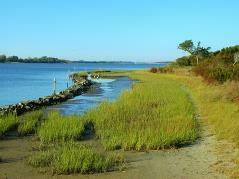 Phase IV – 2013: In 2013 a 305-foot living shoreline was constructed along the southwestern shoreline of Morris Landing. The project included: one 8’ x 104’ low-profile oyster shell and marl bag reef/sill, two 6’ x 100’ to 120’ long oyster dome reefs/sills, one 80’ long vertical wall sill and the restoration of salt marsh habitat with the planting of marsh vegetation seedlings in an area 305-feet long with an average width of 25-feet behind the sills. Funding for the project was provided by the Estuary Restoration Act, NOAA Restoration Center’s Community-based Restoration Program and Restore America’s Estuaries. Phase V – 2016: Throughout 2016, federation staff, with the help of volunteers, will construct a 310-foot living shoreline. 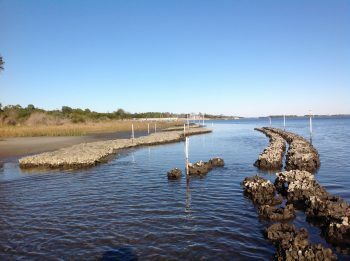 The first 100 feet of the oyster reef sill and marsh restoration were completed in February. The final two oyster reef sills were built by a marine contractor in June and July. Volunteers installed 4,000 Spartina alterniflora seedlings behind the oysters to restore the salt marsh habitat. 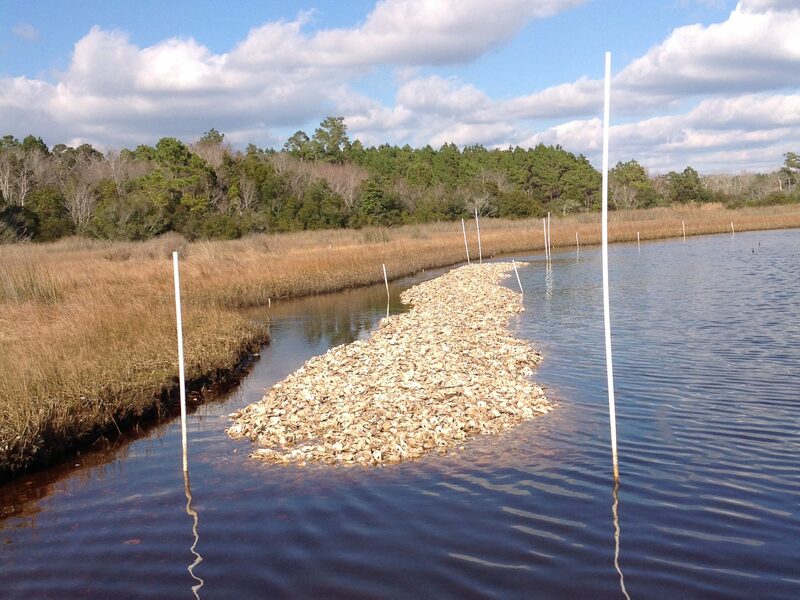 The project consists of three loose oyster shell sills that are each 100-feet long with a 10-foot wide base and a 6’-8’ crest and the enhancement of salt marsh habitat with the planting of marsh vegetation seedlings in an area 310 feet long with an average width of 15-feet behind the sills. Funding for the project was provided by the Atlantic States Marine Fishery Commission through NOAA and the Atlantic Coastal Fish Habitat Partnership through the USFWS. Morris Landing is a key piece in the federation’s and Division of Marine Fisheries’ strategy to restore oysters, enhance shellfish habitat and manage a sustainable oyster fishery in the highly productive waters of Stump Sound and surrounding waters. DMF and the federation have been working to make full use of the site to increase and expand oyster restoration activities. 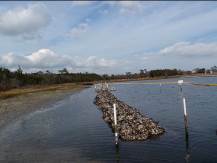 In 2007 DMF prepared a 1-acre portion of the property to stockpile oyster shells for restoration projects. 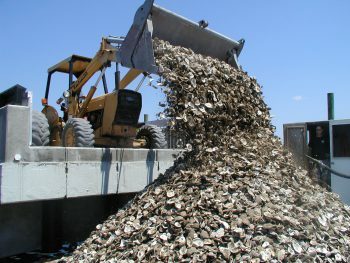 The area can now hold approximately 50,000 bushels of oyster shell. 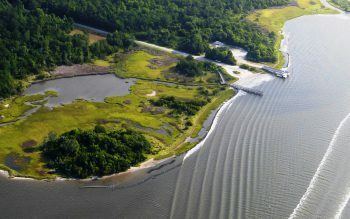 In 2008 as part of the 3-year North Carolina Department of Justice’s Stump Sound Oyster Habitat Restoration Environmental Enhancement Grant, the federation partnered with DMF to construct a heavy-duty pier for loading the shells onto DMF barges. The pier and stockpile area represent the only permanent oyster restoration staging areas between Carteret and Brunswick counties. The site is used to stockpile recycled oyster shell from area restaurants and drop off sites, as well as to store shell and reef material purchased from shucking houses and quarries. Each year between May and August, the reef material gets loaded onto barges and spread out into the shellfish waters of Onslow and Pender counties. The stockpile area and pier at Morris Landing have allowed the federation and DMF to get more shells in Stump Sound and the waters of Onslow and Pender County. The oyster shell-loading pier enabled DMF to increase from 9,000 bushels of oyster shell deployed annually into Stump Sound and adjacent waters to 20,000 to 30,000 bushels annually. 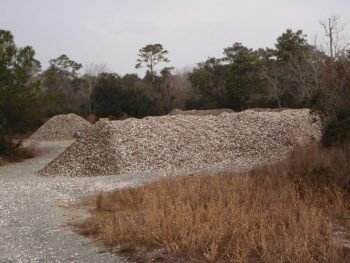 Oyster shells being stockpiled for oyster reef restoration work.